Bertsch is accused of fatally shooting Shelley Hayes March 14. Charging documents say he also shot and wounded Julie and Casey Blanchard as well as Montana Highway Patrol Trooper Wade Palmer. Casey Blanchard and Palmer are now being treated in Salt Lake City. Montana Department of Justice spokesman, John Barnes, says Palmer’s condition is being withheld from the public at the request of his family. "His family at this time is really wanting privacy, as you can understand. This is a very emotional and tumultuous time for them. As regards the specifics of his condition, they’re wanting some privacy and we are respecting that." Palmer’s wife Lindsey issued a statement Monday thanking well-wishers for their support. A GoFundMe account created for Trooper Palmer is rapidly closing in on its $150,000 goal. To avoid the risk of scammers, officials ask GoFundMe donations only be offered through links found at the Montana Highway Patrol Facebook page. A screen capture of the Facebook fundraiser for Casey Blanchard, March 18, 2019. Palmer’s family isn’t the only one now facing extraordinary medical bills as a result of Thursday night’s attack. 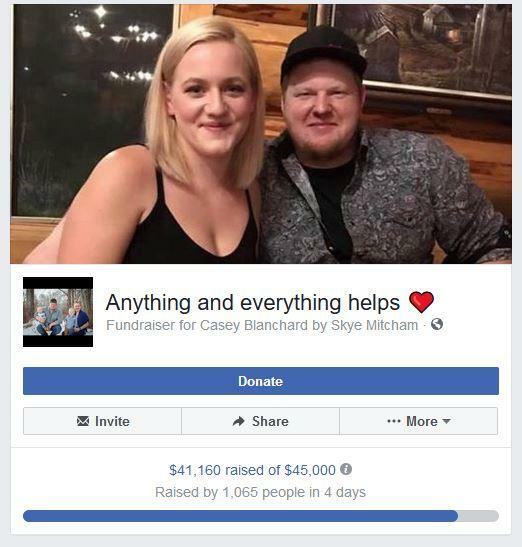 A Facebook Fundraising page set up by someone claiming to be a friend of Casey Blanchard’s family has nearly reached its $45,000 goal. That website reports Casey Blanchard is now in stable condition in Salt Lake City and undergoing a series of surgeries. At the time of this taping, over three-quarters of a $9,500 dollar Facebook fundraising goal has been raised for Casey’s mother, Julie. A separate GoFundMe account to cover Shelley Hayes funeral expenses is currently about $4,000 shy of its $25,000 goal. The financial donations to all of the victims’ families are accompanied by notes, cards, prayers and words of support. Department of Justice spokesman John Barnes says it’s having a tangible impact on Highway Patrol Trooper Wade Palmer’s family. "I think all of this is helping keep Lindsey going through all this. It’s helped keeping her strong. She asked that that message be passed on to people, that she is beyond grateful. Her closing line was, ‘Hold the line and stay strong." The accused shooter, Johnathan Bertsch, asked for a public defender during his initial court appearance on Monday. The head of the Montana Supreme Court says drug and alcohol abuse continues to weigh down the state’s justice system. Chief Justice Mike McGrath this week delivered the State of Judiciary address to lawmakers of the 66th legislative session.